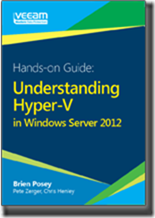 There has been a lot of talk about Hyper-V in its 2012 editions. One of the questions that I hear on a regular basis is about which version of Hyper-V to use. Usually the conversation goes something like this. The language is clear that the focus of Hyper-V Server 2012 is to provide the platform components to run virtual machines for Windows Servers that are already licensed. For example if you were consolidating a group of your existing Windows servers with their existing licenses onto the Hyper-V platform it would be in your best interest to use Hyper-V Server 2012. If you were implementing a Virtual Desktop Infrastructure (VDI) for your existing Licensed Windows environment then Hyper-V Server 2012 is a great solution because here again you already have the OS licenses. But what if you don’t already have the licensed Windows Servers? Windows Server 2012 is all about virtualization rights. Both editions (Standard and Datacenter) have the exact same functionality. The only difference between the two editions is the virtualization rights. Windows Server 2012 Standard edition gives the purchaser the rights to run 2 virtual instances of Windows Server, while the Datacenter Edition has unlimited virtualization rights. That’s it. Now of course Windows Server 2012 also has all of the cool roles and features that you can install on the host machine but when it comes right down to it we generally keep the hosts as clean as possible from running additional workloads outside of Hyper-V. I know someone reading this is thinking, “Couldn’t you run Hyper-V Server 2012 and just buy the Windows Server 2012 licenses?” The answer is; Of course you could. Should you do it? No. Maximize your licensing position by using the full version Windows Server 2012 and add Hyper-V.
For more information about all things Hyper-V in Windows Server 2012 please check out the free E-book from Veeam The Hands-On Guide on Understanding Hyper-V in Windows Server 2012.